2018 Land Pride SPL0560 for sale in Canastota, NY. White's Farm Supply, Inc.
Mon-Fri: 7:00 a.m. 5:00 p.m. Sat: 7:00 a.m. 2:00 p.m. Designed to fit Kubota’s BX tractors with front loaders: Easy to attach to Kubota’s BX tractor loaders with or without Kubota BX6315 Quick Hitch. A good fit for Kubota BX tractors with front loaders. 3/16" Side panels: Built heavy to handle the tough jobs for Kubota BX tractors. Bracing on side panels and back: Reinforces side panels and back for a stronger unit. 1/4" Formed back plate at blade mount: Makes for a strong moldboard. Replaceable skid shoes: Protects the side panels from wear. Operating weight of carrier: 1,800 lbs. Hitch type: Fits Kubota BX front loader hitch, with or without Kubota BX6315 Quick Hitch. Reversible poly blade: The blade can be reversed to extend the life of the blade. 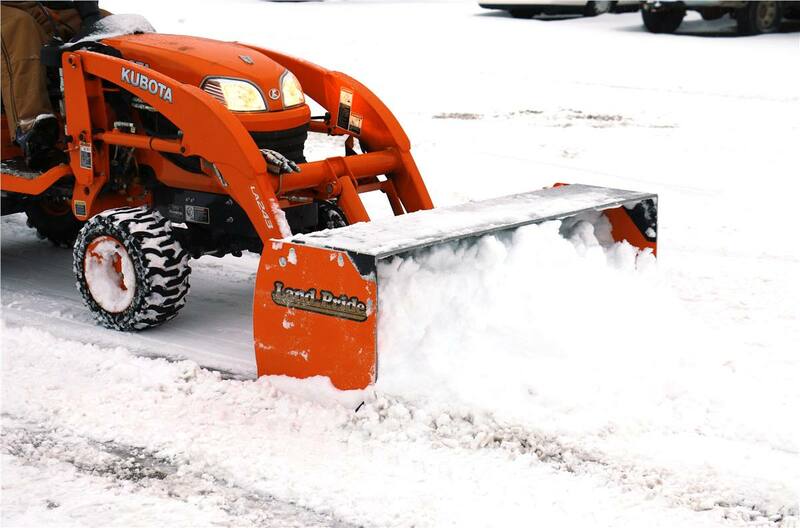 Replaceable poly or steel blades: The blades can be replaced to extend the life of the Snow Pusher. Pull back with 3/8" weld-on steel blade: Used to pull snow away from structures such as garage doors and other objects. 28" High orange marker (accessory): Assist in locating outer ends of the Snow Pusher when approaching buildings, trees, poles, and other obstacles that can damage equipment. With poly blade: 182 lb. ; With steel blade: 190 lb.